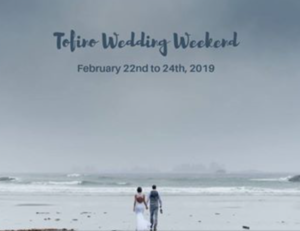 Save the date – and discover the possibilities of your Tofino wedding on the weekend of Saturday, February 23, 2019! This isn’t your typical bridal show – visit our diverse range of venues, decorated for your visit on this special weekend. Join guided tours, where you will meet Tofino’s talented collective of event planners, wedding photographers, floral designers, cake artists, beauty specialists and more. Visit the Facebook event page for up to date information on the Tofino Wedding Weekend.